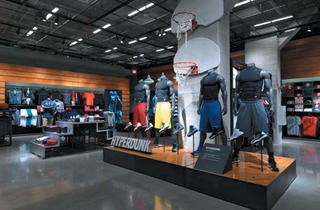 Niketown gets a makeover and debuts a new look and an extra floor as Nike Chicago. 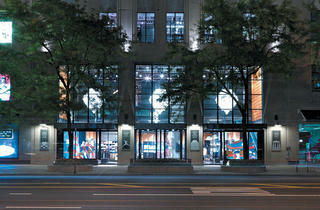 Photograph: Courtesy of NikePark it at one of the Apple computers and a design consultant will walk you through the process of designing your own shoe, from the profile, foot bed and fabric down to the color of the laces and tongue. 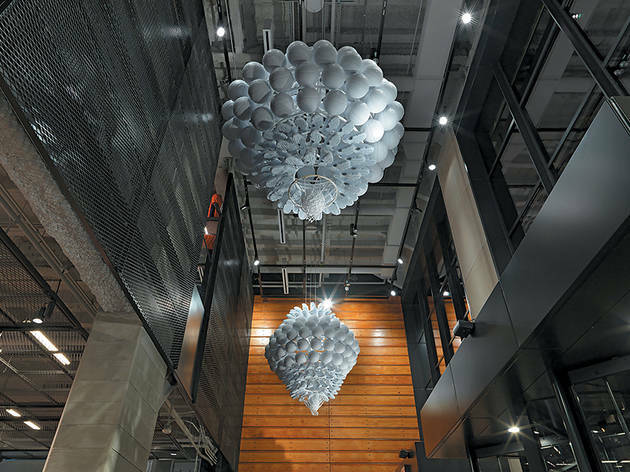 Photograph: Courtesy of NikeAs if a remodel weren�t enough, the building is up for gold LEED certification thanks to efforts like water conservation and use of reclaimed materials. 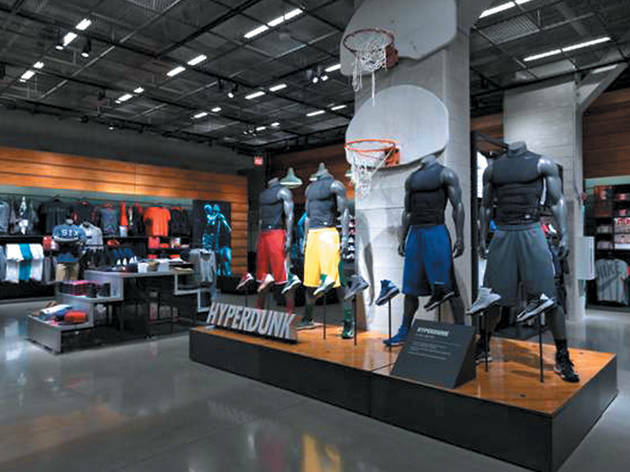 All around the store you�ll find materials repurposed from a Chicago-area high school, including wood bleachers used for the walls, as well as basketball backboards and rims from a Chicago Park District park where the Nike Fuel House moved in for the summer. 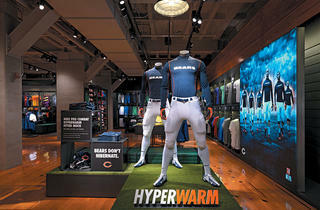 Photograph: Courtesy of NikePick up various styles of jerseys and the new cold-weather wear in the football section. The displays change according to game schedule, highlighting whichever visiting team is in town and, of course, the Bears. 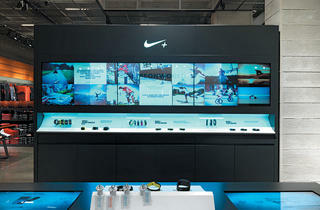 Photograph: Courtesy of NikeA hub in the center of the first floor features a display screen with Nike-related tweets and photos from around the globe. Here customers can also play with high-tech training gadgets. 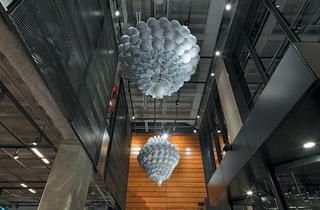 Photograph: Courtesy of NikeStark white chandeliers made from Air Jordans and basketballs hang over the entrance to the shop. 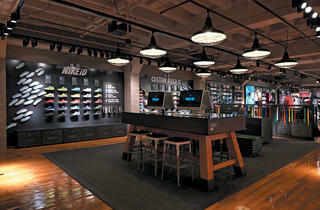 Photograph: Courtesy of NikeBy press time, you�ll be lucky if you can snag a Cody Hudson-designed pair of running shoes. The Chicago designer imagined the red, blue, black and gold display�not to mention the design profile of the shoes themselves�for last week�s Chicago Marathon. Find other nods to local culture like photos of Chicago runners by the El and Chicago-area high school sports-team logos on the wall. 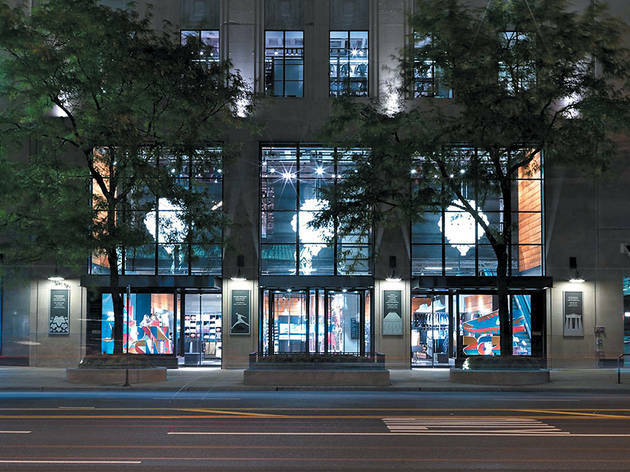 Just moments after I walk through the revolving doors at the recently renovated Nike Chicago, I’m greeted with a high five from a beaming shopgirl. Later, I’ll get many more hand slaps from the around 200 employees—handpicked from a pool of more than 6,000 applicants—positioned in every corner of the store. There are also cheers, lots of them, resonating like waves up and down the four floors. 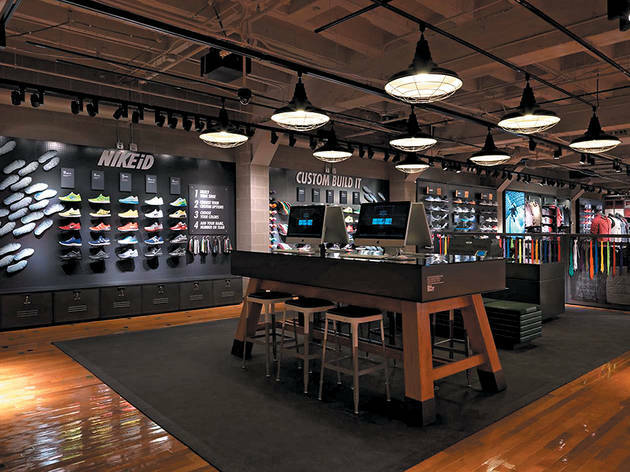 Nike is a brand that elicits a hyper-enthusiastic following, including people who wait in a 100-plus-long line early Saturday mornings to get their hands on a new sneaker before it sells out. 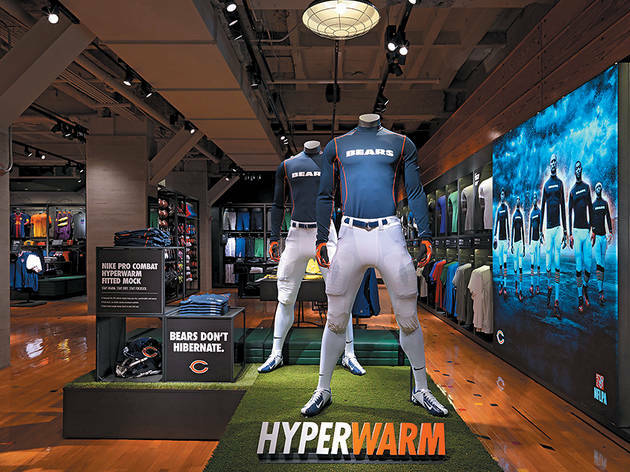 That same enthusiasm motivated a Chicago couple to play hooky 20 years ago to attend Niketown’s grand-opening day and catch a glimpse of esteemed baseball and football player Bo Jackson. That same couple arrived on reopening day, and so did Bo. What’s so great about the new Nike Chicago? 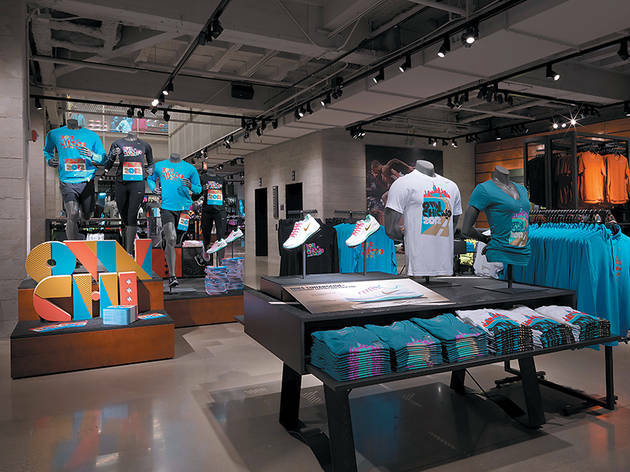 Following in the footsteps of seven other “brand experience” stores around the country, the more than 50,000-square-foot shop integrates lifestyle elements into the various sport sections. 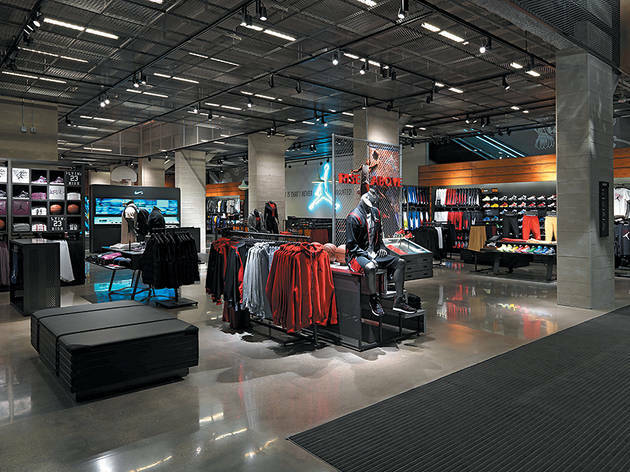 For instance, in the basketball area, which now occupies the entire first floor, you’ll find athletic Dunks and compression shorts for wearing on the court, but you’ll also see style pieces such as camo jackets and Air Force 1 high-tops for playing around. 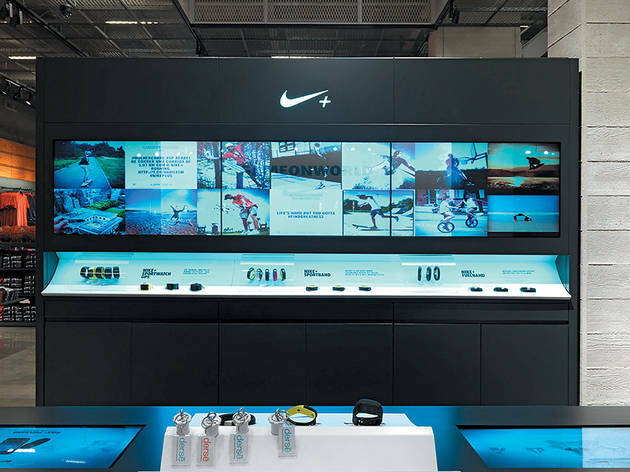 Getting a feel for the multifaceted Nike universe here also encompasses testing out the digital devices (like the FuelBand), playing with the Nike ID customizable shoe program—previously only available online—and taking in the locally rooted design details. 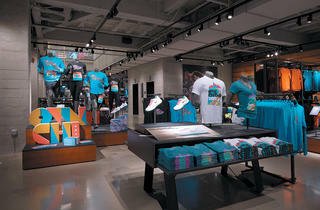 Nike Chicago also offers other interactive experiences: Stop by the store any Thursday night to join the Nike+ Run Club, or Tuesday nights starting Tuesday 16 for the Nike Training Club for year-round workouts with trainers at an area park. An homage to Air Jordan reflects Nike and Jordan’s long-standing relationship. 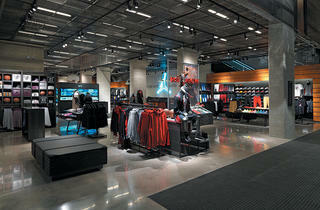 Find 23 pairs of Air Jordans on display and illuminated, plus empty shelves to fill in for years to come.